I’ve had the “letting go” theme pop up quite a bit lately, professionally and personally. Letting go has shown up not in big ways but in small ways, mostly through experiences created by me and for me. I guess the Universe is indicating it is time for a little more practice! How are you doing with letting go? Maybe there is some learning and practice for you here as well! I was walking along the shore in Fort Bragg, CA and noticed an object that looked out of place. It was tucked into a giant driftwood tree limb. I got closer and saw it was a beautiful painted rock. She is far more pragmatic than I and said, “You found it. It was meant for you. Keep it.” So I did. When I got home I noticed on the back it said, “Find on FB Napa Rocks.” I searched for Napa Rocks on Facebook and found this amazing group of people who actually paint rocks and leave them for others to find. They do this without expectation! The instructions on the page indicate that you can keep the rock, leave the rock, rehide the rock, or paint your own and hide it—you choose your way to keep the rock love going. I searched further and found there are painted rock groups all over the country, and I’m sure they extend all over the world. There are people painting rocks with images that are fun, uplifting, and generally beautiful and leaving them in public places without any expectation of what the finder will do, how they will feel, or if the rock will even be found. Wow! The request is that if you do find a rock, you post a picture of where you found it on the Facebook page listed on the back of the rock. I did this with the Napa Rock I found, and within minutes the person who hid it responded with delight equal to mine. We determined that she had left it just minutes before I found it. It was amazing to me that we were now connected in a cause-and-effect kind of way without ever having met. We were in the same physical space without knowing it, and her action caused me joy that I was now eager to pass on to others. I knew immediately I would begin painting rocks and leaving them in my own community and in the places I travel. The group I chose to join is called West Coast Painted Rocks (#WCPR) on Facebook. I’ve painted and hidden about 100 rocks at this point. I’ve left them in Sacramento, Del Ray, San Diego, San Marcos, San Luis Obispo, Grover Beach, Glen Allen, Carmichael, and Saint Helena; I’ve also sent them to Boston. Out of all the rocks I’ve hidden, I’ve only had two or three people post that they found them. This experience has been a significant lesson in letting go without expectation. I realized this weekend that my attention had shifted from the joy of creating and giving to expectation about what people finding the rocks should do. As I made that shift, I began to feel some resentment, and my desire to pass joy became darkened. Wow! But once I noticed and let go of any expectation of what others should do, I stepped back into the joy. In other words, I could manage what I felt simply by noticing and shifting my focus from them to me. In retreats that I facilitate with teams, we frequently grapple with managing how we shift between victim, villain, and hero, all by letting go of expectations of what others should do or feel. I am deeply moved by the Give Away Ceremony that is part of Native American tradition. In a nutshell, my understanding of the Give Away is that you choose to give away something of value to you, something beloved, without expectation or strings attached. The Give Away item isn’t something you no longer need or want, but the growth comes through it being a bit of a sacrifice to part with. Letting it go without any expectation of how appreciated it is, how it is valued, or how it is used is where the growth in our own personal journey happens. Team members who are dealing with transitions, change, or other facets of having to let go in order to grow are asked to bring a personal gift that is important to them individually—something that is beloved, has served them well, and about which they will feel a bit of sacrifice through the act of letting go. The gift is wrapped without any markings identifying the giver. This activity, which I’ve not explained in advance, is generally toward the end of our time together. Each person remains silent and takes their turn looking at the wrapped gifts. I ask them to let an energetic pull help them select the gift, instead of using their thinking mind. They open the gift while all remain silent. The giver is still not identified. It is fascinating that as the group notices the joy of the person receiving, the giver frequently experiences discomfort as they struggle with not being able to explain or rationalize their gift. The person receiving verbally expresses why that particular gift was meant for them and what message or purpose they are taking from it. And then the next person takes their turn. Each time I’ve done this the givers are amazed at the depth of meaning the person receiving the gift discerned, all without meaning or expectations created by the giver in advance. Some say that listening to the receiver describe the gift and what they took from it was far more valuable than what they desired to share about what they brought. I often coach people who need to let go of employees whom they like and care for but who aren’t working out. As we talk through the process, they frequently talk about all their expectations for how the person being let go may feel, react, or move forward. They project all kinds of stories and expectations onto the person, and frankly, they torment themselves with it all. Last week I was working through this with a client, and I remembered how I feel when I have to let go of one of my painted rocks. If my expectation is that it will be found and that someone will experience the same joy I did when I found my first rock (and that they will let me know), I sabotage all the joy I felt in creating and hiding the art. I take away from my entire experience because I have expectations for another person. When we have to let go of people who are not working in service of the team, for the good of the organization, or even in their own best interest, we frequently want to take care of ourselves by telling them all that we see and believe about their transition out of the organization. Who is that for? The giver or the receiver? When we must let people go, we are gifting them with a new experience; we don’t get to project upon them why this is good for them. They will discern the immediate and the long-term message for themselves. When we release what must be released with only the hope that the receiver will get whatever it is they most need from the experience—and we accept that we can’t possibly know what that is—the stress, tension, potential resentment, and anger that can come along with expectations are also let go. The next time you have something to give, to contribute, to share, or to take action on, be fully present in your own experience. Release all attachment to how the other should feel or what they should know. As you release, do so fully without attachment. 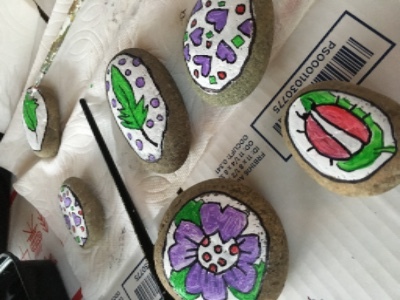 Letting go of my painted rocks is a great practice! To read more stories and lessons in letting go, grab your copy of Beth’s book Let Go of the Rock.